The Department of Commerce has approved the constitutional change to financial year end made at the AGM. The financial period this time will he a period of 15 months to 30 June 2014. At this stage, we are planning to hold the 2014 AGM in July, but will revisit this as the time gets closer to ensure we do not clash with any member activities. 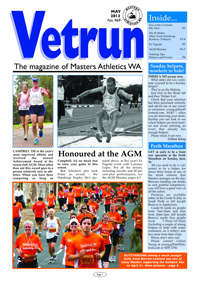 The latest edition of Vetrun in now available for download in both high and low resolution. Please go to the magazines menu or alternatively click here. The AMA website has been updated and now has a summary of each of the 41 AMA T&F Championships from 1973 to 2013. Click here to view our new gallery containing the best photos from our Sunday Runs. Both pages 1 and 2 of the Sunday Programme can now be found on the Road tab. Click here. These sheets will be sent out with the May vetrun. If you are renewing or joining you can use this list, in conjunction with the Sunday Programme, to find 2 Sunday help dates where helpers are still required. If you have already made your selection check this list to make sure it has been processed correctly. This list will be regularly updated, and appears on the Helpers page under the Road tag.